Discussion in 'Classic Menswear' started by Mild Mannered, Sep 27, 2009. I am in no way affiliated with Allen Edmonds. I did a search here and nothing came up, so I would like all those who enjoy their Allen Edmonds shoes to participate in this thread. With respect to the rich boys here, this thread is for the rest of us, to also enjoy our shoes too. we do have our own 'High End' shoe options; that being primarily Allen Edmonds. Please take the time to browse through the 5 pages on that thread. I am sure there is something for everyone, in particular some 'sneak previews' of AE's 2010 Spring lineup. Some of those models I think may even win over some of the 'hard-boiled' anti-AE souls on here. 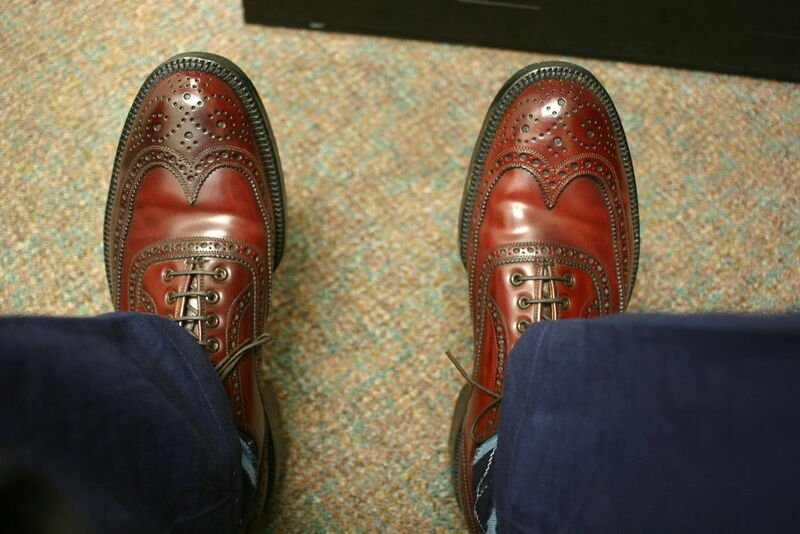 Discussion & photos of your favourite Allen Edmonds shoes is requested. Discussion of all things positive is encouraged. Please share your favourite AE's with us. What do you like on your favourite models? etc. whether old or newer models. I like those camp moccasins. Do you reckon they're suitable for sunny winter days? Is it a good idea to soak Allen-Edmonds in the tub for several hours to get rid of the tanning chemicals? ^^ OP: I enjoyed the photos but unfortunately I don't think you will win over any "hard-boiled" AE haters. They are very set in their ways. That shoe on the lower right (the Norwegian toe moccasin) looks very interesting. E would get a lot more love around here if they could return to the quality and styles they offered in ye olde days. The Classic Collection is a good start in that direction, but they could do more to better execute these shoes. OP, You had me at the title, should have stopped typing and put a picture in the post instead of that tripe. I recently purchased my 3rd pair of AE (all eBay, all since joining SF in July), and like them. Definitely much better than what I was wearing before. I use MAC Gun Metal grey eyeshadow brushed on lightly with a wide soft sable brush. Only if you hang them to dry near a hot fire afterward; eschewing the use of a bath sheet, of course. And have I mentioned..."Curse you people for suckering me into this whole Allen Edmonds thing."? It was the restoration videos that really got to me. Show me a "how it's made" video and I'm yours for life. I still remember how they make basketballs from a film we saw at school (in the ancient, stone-age days before video for you youngsters). And I don't even care to play basketball. Pity For The Panda Shaped? Seriously. And posting "no negativity" is just prodding people to do so. You learn that in 5th grade. Maybe OP is home schooled? The ones on the lower left are the only ones I'd consider but I don't really like the toe shape. I have a pair of black AEs (Saks model IIRC) that is exclusive for funerals and interviews. Got em for $75 so no complaints. I don't understand the attitude of careful spending getting mediocre middle of the road shoes. I'd rather buy cheap temporary stuff (that is required) and save up for the best that I really wanted. If you have 12+ pairs, you could have bought alot less and gotten something nicer. Quality>quantity One thing I really like about MC is you guys go for the best without cutting corners, AKA big tymers. One thing I really like about MC is you guys go for the best without cutting corners, AKA big tymers. To paraphrase Giles Corey's fictional sayings: "More welt!" what were you wearing before? My guess? JM &amp; below. The best shoe in my collection is a pair of vintage allen edmonds shell wingtipd. I don't won any of their current models - I have nothing againsr AE, but I find most of their current shoes a bit meh. There are some nice models available, but nothing interesting enough to pull me over from my beloved aldens. I've been buying AE for a while now. I've got a pair of burgundy Hilcrests that are probably my favorite pair of shoes. Had them probably six years. They're big and heavy, and I like that in an American shoe. That said, I bought a pair of AE's last year, and it's clear the quality has gone downhill some. Leather isn't as good as what I'm accustomed, and some of the stitching has already come loose after a handful of wearings. It's bad enogh that my next purchase will probably be Alden or C+J. I wont mind paying a little more.